The other day it occurred to the Mr Mess and I that although we are members of the National Trust, we haven’t actually used our card once this year! I decided this just wouldn’t do and so hastily arranged a few trips for us to go and see some of the properties during the Christmas season. I have always wanted to go to Calke Abbey, but I’ve just never found the time. After looking at their website I decided this was the perfect opportunity and so last Saturday I dragged the family out for a jaunt into Derbyshire. I wasn’t really sure what to expect, as every National Trust property is different, but I had heard that this was a stately home the offered something unusual. Caleb Abbey is described as the “Unstately Home” and represents the decline of Country Houses when they don’t receive the support that the national trust offers. The approach to Calke Abbey is through some seriously beautiful parkland. Unfortunately I took virtually no photographs on the day as my phone was running flat and I wanted to save the battery for later. There was a little playground for the kids, which is always one of the first things the girls will ask. It had rained quite a lot the day before so all of the equipment was wet, but that didn’t stop the girls from having a bit of a play. Sadly the main house was shut for the day and so we didn’t get to have a full explore. There was a lovely walk through the cellar tunnels which had been decorated with lights and other festive items. The Twinkling Tunnels (as they were called) were very cute. Each of the girls was given an imitation candle to carry as they walked through which they thought was brilliant. They each had their own little adventure in the tunnels. In the stables area we came upon this gem of a carousel. It was really old fashioned and quanint and was manually operated which I have never seen before. The girls loved it and had three rides over the course of the day. 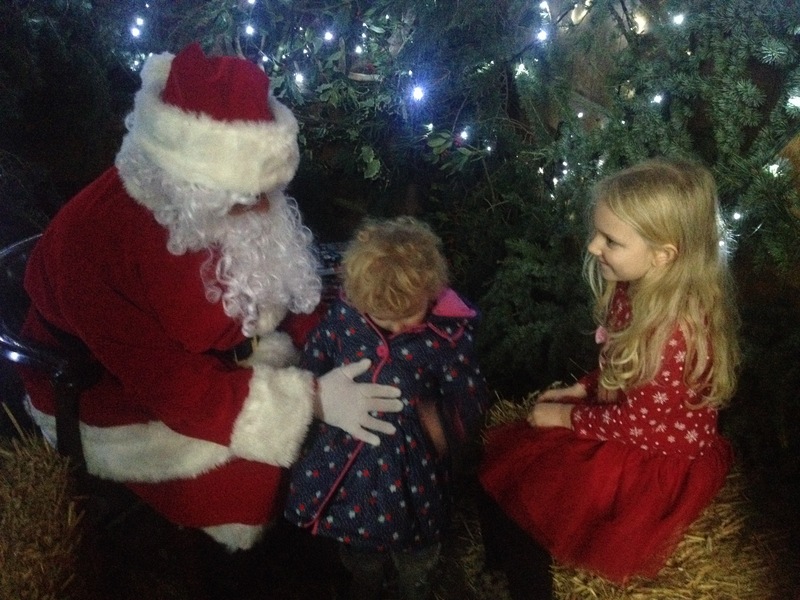 As a special treat I’d booked for the girls to meet Santa in his grotto. The event cost £5, including a present for each child. He was a really nice Santa. He spent ages talking to the girls and really took the time to get to know them. He also had some pretty fantastic ballet knowledge so had a fascinating conversation with Miss Mess. Each of the girls was given a gift. Both were books about animals. Miss Mess’s features a pop-up cobra which couldn’t be more inappropriate for a mummy with a snake phobia, but she likes it so that’s the important thing. There was also a shop and restaurant and a walk up to the church, although we didn’t get to look around properly. This all occurred on the same day as the masquerade so we had to cut our visit short. Luckily we’ve discovered our National Trust membership doesn’t run out util March so hopefully we’ll get to go back there soon and have a proper explore. This entry was posted in Blogmas and tagged calke abbey, carousel, christmas, Derbyshire, national trust.